Robert P. Ryan’s work explores themes of identity, absence and disconnection. Working primarily in oils, he employs a traditional painting technique which slowly builds up layers of transparent glazes, to accomplish a greater sense of depth and light. A graduate from the Limerick School of Art and Design, he is now based in West Cork, Ireland. An example of a “Hidden Mother”. Stifled poses, simplified compositions and colouring reminiscent of hand-painted photographs; Robert P. Ryan’s paintings display a firm connection to photography and the aesthetic of its infancy. Nothing had more of an effect on painting than the birth of modern photography, which in turn adopted much from traditional painting. The interaction of these mediums and how their identities are defined and redefined in relation to each other is explored as a continuation of the parent/child dynamic that runs throughout the work. The depiction of a cloaked female figure is featured regularly. 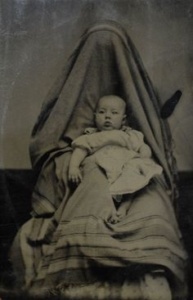 This is inspired by a convention of early photography which attempted to conceal mothers who were holding their children for the then lengthy exposure times. Draped in fabric, these figures are pushed into the background and cropped from frame. Robert P. Ryan brings these figures to the fore and presents them. These ghostly figures are a representation of an absence. The work is an attempt to grasp a figure that seems perpetually present and yet always out of sight.